Chain restaurants are generally not my favorite, though for some they offer consistency in their food needs. But I am all for trying new places, especially when the new place is offering free food as part of their soft opening. 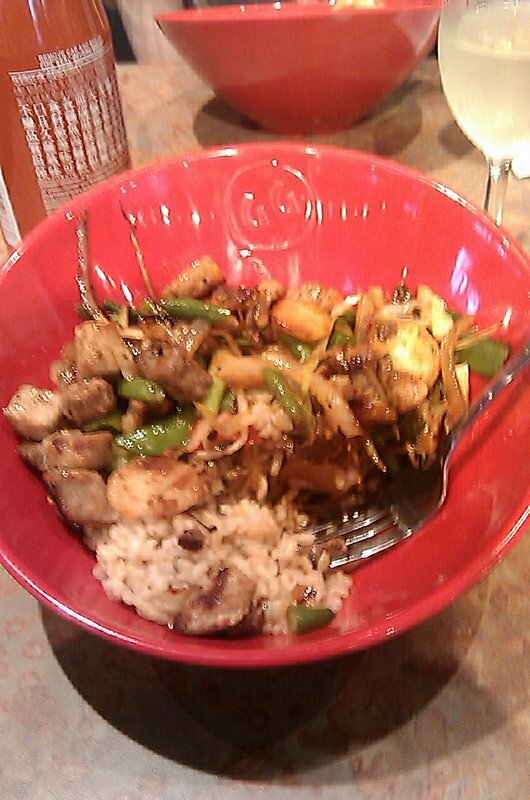 And thus, I stumbled into Genghis Grill, by the Central Market at Lamar and Westgate. The owner of the franchise was greeting customers at the door, and after a few minute wait, we were seated. A very enthusiastic waitress welcomed us, explained how things worked, took our drink order, and encouraged us to get in the line. When you are first seated, you are given a stainless steel bowl that will become your bowl to fill with protein and veggies as you please. It's set up like a big salad bar with raw proteins first, dry spices, vegetables, and various sauce combos. You can create your own eating adventure or choose a card that has a formula for one of their signature bowls. 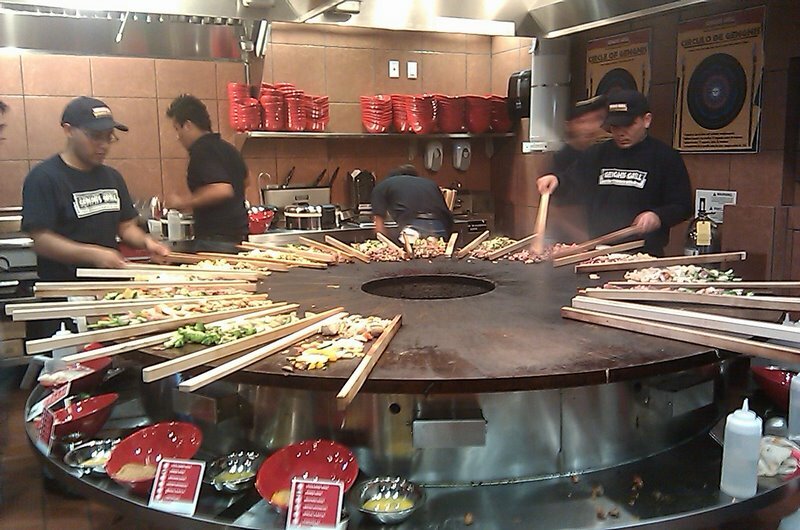 You then take your bowl to the grill station; I was impressed with how they immediately asked if I had any allergies. They marked the ones that did, as well as for the vegetarian eaters, and I ASSUME grilled those separate from the meaty, glutenous, soy-infused bowls. You're also asked what type of starch you'd like -- white/brown/fried rice, udon noodles, pasta, or...tortillas? I was totally fascinated by their grilling system, and it appears to work flawlessly. They take your bowl, give you a number, and then it's grilled on a huge 10 foot (+/-) diameter grill, where each order is conveniently separated by wooden stakes, and your number placed beneath. (I always wondered how the lone grill master at the Mongolian BBQ place downtown remembered whose bowl was whose.) You go and sit back down, and once the bowls are ready, they are brought to your table. What I am most impressed with is their website. Under their build a bowl section, for every single component you add to your bowl, it will show you the nutritional information for the item, and it runs a cumulative tab at the bottom of the page. Particularly for people who need to watch their sodium levels, I think they'd be SHOCKED to actually see how much sodium they are consuming, depending on their choices. More restaurants should do this. Overall, it was a good experience. Everything was extremely fresh, and the service was good. Will both of those keep up? It was rather loud in there though, one because it was packed, as the word of "free food" had gotten out, and two, because they have televisions with sporting events blaring. Really? Do we need tv's in restaurants. In my opinion, NO, unless you're a sports bar. Big turnoff for me. Would I go back? Maybe. If I was ravenous, I'd get the "bottomless bowl", and maybe take some home. I think lunch is $9, dinner is $10, and bottomless is $12. It was fun, but I also know how to cook a pretty good stir fry myself.